After giving much consideration I've decided to pull two of the titles in my Ring Dreams series. I plan on breaking Headlocks & Hexes down into two more in depth stories to break the Dalton brothers stories into two separate books - Vexed and Hexed. 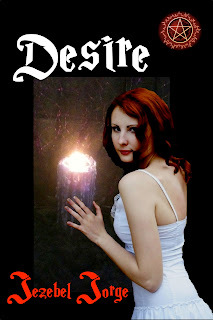 I also decided to go with a new cover for Desire. I think it gives a better feel for the book with Lizzie on the cover with the candle she received as a mysterious give from Odessa. Desire is the story of how Billy Dalton met the love of his life Elizabeth (Lizzie) Dalton. It's set in the Carolinas in the 1970s when pro wrestling was a huge draw in this area. Lizzie's father Paul Bryson is the territory's top star and he's not about to let his only daughter hook up with Billy Dalton. In this era the wrestlers went to great lengths to keep their wives and daughters away from the wrestling business. A lot of the wrestlers led a double life with mistresses and girlfriends on the road. Paul Bryson was notorious among the ring rats (groupies) and the boys (his fellow wrestlers) for his womanizing. With his dark haired good looks and Texas charm, Billy Dalton was an instant sensation with the female fans. Paul sees a lot of himself in a young Billy and decides to take him under his wing to mentor and groom him to someday take over his spot as the territory's lead babyface (good guy fan favorite). At least until Billy falls for pampered and protected Lizzie. Lizzie loves her daddy, but she's determined to strike out on her own and make a life with Billy. Along the way she meets her best friend Elena, a jaded ring rat who has every intention of smartening her up to what really goes on when the wrestlers are on the road. Desire is a coming of age love story where Lizzie has to come to terms with her father's double life and decide if she can handle spending the rest of her life with a man very much like her father.